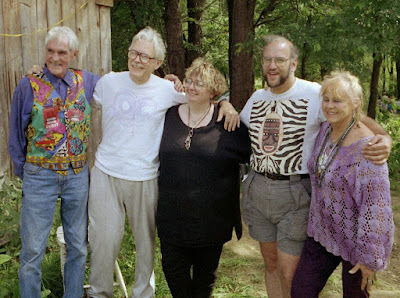 Timothy Leary, Robert Shea, Patricia Monaghan, Jeff Rosenbaum, Gillie Smythe at an Association for Consciousness Expansion gathering in Cleveland. The late Patricia Monaghan, Robert Shea's widow, wrote a superb essay on how she dealt with her grief after the death of Shea. I'm not the only one who thought it was pretty good "Physics and Grief," originally published in a magazine called Fourth Genre, was reprinted in a 2005 Pushcard Prize anthology. The anthology is a "best of" from little magazines and small presses. I had been crying for months, ever since Bob had finally died, fighting cancer to the last. 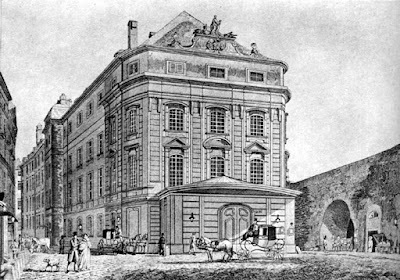 The six months before his death were exhausting. For three months I was his sole caregiver; then, during his final hospitalization, I visited him two, three, even four times each day. Economics forced me to continue working, so I had neither physical strength nor emotional resources left when he died. You learn quite a bit about Shea from the essay -- Monaghan writes, "One thing I loved about Bob was this: he had more integrity than any person I'd ever met. That integrity remained to the end." But the main subject of the essay is about how Monaghan found that study physics, particularly quantum mechanics, helped her cope with her grief. (She mentions Nick Herbert, apparently one of the writers she read.) Monaghan describes various theories of quantum mechanics that helped her think about the mystery of Shea's life and death. Whatever part of that great thought once appeared as Bob Shea still exists, I believe, somewhere in the network of this universe. He has only "departed from this strange world a little ahead of me." If you've read Robert Anton Wilson's Cosmic Trigger, you probably remember the bit about Aldous Huxley's attempt to communicate with his widow after he died. There's a similar thread in Monaghan's essay, in which she calls about Shea to help her find a set of keys that she lost. I won't give away the ending. Monaghan herself died in 2012, also after a long battle with cancer, so her essay is both part of her literary legacy and a way to come to terms with her death. If you want to read Monaghan's essay, you can hunt up and read a copy of the 29th edition of the Pushcart Prize anthology, which reprints the best of small presses and journals. It was edited by Bill Henderson and has a copyright of 2005. The ISBN for the hardcover is 1-888889-40-3. A competent librarian using interlibrary loan should be able to get a copy of the book in your hands. 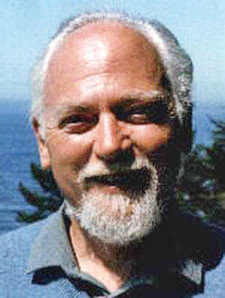 The essay originally was published in Fourth Genre, a nonfiction journal published by Michigan State University. You can purchase a paper copy or a secure PDF by going here.